Back in the summer of 2007 -- right around the time I started this blog, actually -- I was working in the heart of Columbia, SC. Fresh out of college, I was working as a graphic designer and errand boy at a small ad firm on the second floor of one of Columbia's few high-rises. That summer was a good one: My job only required about a 20 hour work week, and my paychecks easily covered bills. With what I had left, I'd scoop up new releases at Papa Jazz Records in Five Points. These included Emotionalism by the Avett Brothers, The National's Boxer, and Andrew Bird's Armchair Apocrypha. As luck would have it, I found Armchair used for about six bucks, only weeks after its release. And you know what? Armchair Apocrypha is a damn good album. It never quite got the credit it deserved. It did earn high scores among critics, but 'classic' status has eluded it. 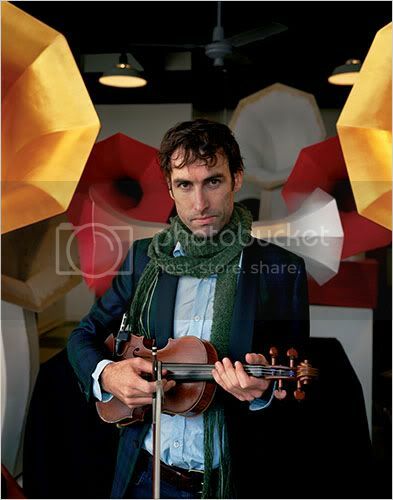 It's usually overshadowed by its predecessor, Andrew Bird & The Mysterious Production of Eggs. Even last year's Noble Beast seems to be enjoying lasting accreditation not afforded to Armchair. Armchair boasts a dozen ornate, enduring tracks that won't leap off the record like Eggs standout "Fake Palindromes". Instead, they entice the listener with a sort of majestic stillness. The production is more spacious than on either of the aforementioned albums, and Bird's vocals are at times barely above a mumble. At other times--most notably in the sprawling seven-minute "Armchairs"--Bird delivers Buckley-esque wails that underscore his versatility as a singer. As I've written before, few singers can sound like Mark Kozelek one minute and Jeff Buckley the next. It's hard to say what my favorite track from the album is, for two reasons. First of all, there aren't any misses, so the pool of contenders is large. Secondly, as I mentioned, there isn't an obvious pack-leader like "Fake Palindromes". You could make a case for opener "Fiery Crash", "Imitosis" (which I believe was the single), "Dark Matter", and several more. But by and large, there is a steadily high level of quality that's maintained over the course of Armchairs. I'm particularly fascinated by tracks nine and ten, "Cataracts" and "Scythian Empires" respectively. The former is the most unadorned track on the album, a ballad steeped in soothing melancholy that reminds Bird's followers that the term "minimalist approach" is in his vocabulary. It's followed by "Scythian Empires", which features an elegant build into a sprawling chorus that won the night in a live setting. I encourage those of you who don't know Armchair Apocrypha to seek it out. It may not be the flashiest of Bird's albums, but it doesn't strive for that. It's a musical art gallery, each song its own painting, framed and hung for peaceful observation.